It’s Friday, which for us is one of the two days during the week that vendors set up along our quiet street for our neighborhood farmers’ market. We are so grateful and fortunate to have the luxury to step right outside our apartment which spills directly onto a beautiful, tree-lined street with vendors selling everything from fresh fruits and vegetables, fish, cheeses, flowers and freshly baked breads. Todays farmers’ market haul not only yielded some beautiful strawberries, which I plan to make a strawberry chia seed agua fresca with, but we also scored on some wonderfully plump blueberries. 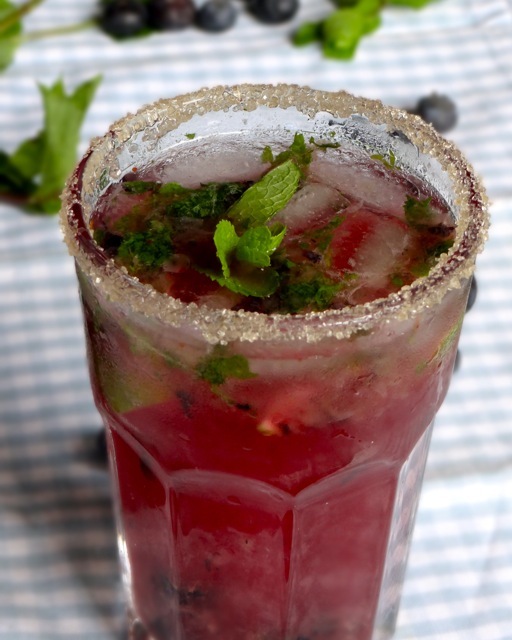 We used a few of them to make these Blueberry Mojitos. When we washed our plump market finds they tumbled around in our colander like soapstone marbles both in weight and in color – in the way that blueberries have a faint dusty, white coating on them. These antioxidant-rich blueberries were not only plump, but perfectly sweet and were just what we needed for our twist on the mojito. TGIF! 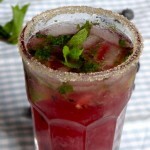 Place the lime, blueberries, mint leaves and sugar in a 16-ounce glass. Muddle the ingredients using a cocktail muddler. Alternatively, you can cut the ingredients or mash them with a fork or the end of a wooden spoon. Add the juice and fill the glass with ice. Then, add soda water to fill the glass. Garnish with whole blueberries and mint spring and enjoy. *If you are sugar-coating your rim, start by dampening the rim of your glass with a lime wedge. Then, dip the rim a shallow plate filled with about 3 tablespoons of raw sugar.